And so ends another live text. Our online team are preparing some post-match pieces for the website just now. Look out for those and please join us again on Sunday when we'll have live coverage of Partick Thistle's match against Celtic (kick-off 12:30 BST) and Aberdeen's home league game against Kilmarnock (15:00 BST). Thanks for your company this afternoon. "The second half was much better and I think it was a deserved equaliser. You want that first win and if you can't get a win you want a point. It's a good point against a good side. I know how we're going to shape up for the season. We're being punished for wee individual errors at the moment." "It's a fantastic three points. Motherwell are much improved. In the first 20 minutes they cost us a lot of problems. It took us time to get into the game. Both goalkeepers had some fantastic saves. I'm delighted the way we finished the game off. Charlie Telfer got in a few positions. They are trying, they are doing the right things." "We've been poor for two set pieces and that's what's cost us in the end. We had a few chances but we haven't put them away. We should be doing better defending free kicks. We go again next week. It's not the way we wanted to start. They are under no illusions how unacceptable that is." "It's such small margins. We missed the penalty and they go up the park and score a soft goal, from our point of view. We always try to get the ball down and try to pass it. And they got a goal on the stroke of half-time that gave us a mountain to climb. We've got a bit of scope to bring players in. A lot of what we are doing is right; it's just if someone is there and I think they can improve us." "We weren't at our best today at all and we've got Scott Fox to thank for keeping us in the game. Hamilton started very well and we struggled. It was a great save for the penalty and we went up and scored against the run of play. The grit, determination and character was there for all to see. It wasn't a pretty performance but we did the ugly side of the game well today. It's about getting points on the board as early as possible. We saw last season how the nervousness can build up wondering when that first win is going to come so it's great to get it here in front of our fans, who were fantastic today. They will know we can play better. When you bring in 12 new players it's going to take time. I'm delighted to get the three points." "I think I read that it was 1995 the last time Thistle beat Celtic. It will be a brave man who is rushing to the bookie's to put a bet on Thistle." Craig's right, you know. The Jags last beat Celtic on 2 May 1995. It was 3-1. Since then, Celtic have won 18 and drawn one of the matches between the teams. "I've no complaints about the effort - I'm so, so proud of them. We can build on that. Some of them have got to get up to speed in terms of fitness. I'm just finding that vibe in the dressing room that we had last year. We had the kids on the bench. Ryan Christie will play for Scotland. He's quite happy at Inverness and he's learning his trade. Like Scott Arfield, he went down to England, but after 100 games. Christie's a kid. He'll get stronger when he gets older." So Hearts, last year's runaway winners in the Championship, sit atop the Premiership, with two wins out of two. "We've got to be ruthless in front of goal. They changed it at half-time and got in our faces. We just didn't pass it and move the ball quickly enough. We didn't stop enough crosses coming into the box. I was pleased for 45 minutes but for the other 45 I wasn't pleased." "I think he possibly got it wrong, the shape. They were sluggish, their two centre-backs were poor. But what a change in the second half. It was a tactical change by Neilson, a change of shape. Juanma's second goal was superb. That type of skill wins games. From the start of the second half Hearts dominated and Dundee had no answer." "Dundee pressed us hard. They dominated the first half. Our shape changed in the second half. It's another three points and we move on to the game against Motherwell. I was expecting them to play three up front, but Rory Loy got an injury during the week. They changed their shape but it didn't quite work out. In the first half Dundee were hungrier. Dens Park is a difficult place to come. They are a very good team. It's a great result." What a result that is for Dunfermline, winning 6-1 at Brechin, with Josh Falkingham scoring the final goal for the Pars in the final minute. An own goal by Louis Laing put Motherwell in trouble and they were made to suffer further punishment when their goalkeeper Connor Ripley moved up for a corner and though he chased back he could not stop Simon Murray adding United's last-gasp second. Disaster for Motherwell as they chase the equaliser. Connor Ripley goes up for the corner but United break and Simon Murray scores past the despairing goalkeeper who made it back just in time to see the ball fly by him. Craig Curran's double sees County seal the points as Hamilton rue that early Ali Crawford missed penalty. It's a sickener for Inverness as that late Graham Cummins header earns the home team a point. Morton salvage a point at home in their Championship opener having unfurled the League One flag prior to kick-off. Substitute Graham Cummins heads St Johnstone level. Has he salvaged a point for the home side? Gavin Reilly and Sam Nicholson combine against an exposed Dundee defence but the latter's shot from 18 yards is powderpuff. Motherwell defender Louis Laing slashes at a cross from United's Paul Dixon and he and his helpless goalkeeper Connor Ripley look on in horror as the ball ends up in the net. Much to the crowd's delight, David Clarkson is introduced to the Motherwell attack as they search for the breakthrough at Fir Park. Scott, Glasgow: "As a St Johnstone fan it grieves me to say it but they could be relegation fodder this season. Ageing centre halves, no decent striker and mediocre 'playmakers'." "How on earth did he miss that?! It was John Baird! He was a yard from goal. I can't believe I saw that! It was the equivalent of falling out a plane and missing the earth." Hibernian have 18 minutes to pull themselves level away to Dumbarton in the Championship. They trail 2-1. A crowd of 4,589 is hoping there's a goal at Fir Park, though not everyone wants it at the same end of the ground. Luis Zwick makes a good save as a corner is swung in, Louis Moult rises at the back post and sees his header tipped over the bar by the German. Ross County have had to make a change to their goalie, with the injured Scott Fox replaced by Daniel Bachmann. Inverness remain the most likely side to score at McDiarmid Park. Dani Lopez and Ryan Christie have been off target with second-half efforts and the Highlanders will not want to go into the closing stages only a goal up having had so much of the play. "Hearts are now in the ascendancy and they will be looking to make things more difficult for Dundee." There's a yellow card for Motherwell's Jack Leitch as he slides in and gets nowhere near the ball. Well boss Ian Baraclough sends on Louis Moult for Wes Fletcher for the last half hour. Still @RCFCStaggies 2 @acciesfc 0 - McKinnon going close for Accies but County looking fairly comfortable and more menacing where it counts. It's two goals for Juanma as the Hearts striker slaloms his way into the penalty box from the left, leaving a trail of defenders behind him, and tucks away a lovely finish. Morton are back on level terms against Falkirk in the Championship, Peter MacDonald knocking in a near-post header to make it 1-1. Juanma levels from the spot for Hearts, sending Dundee goalie Scott Bain the wrong way, in the coolest of fashions. Hearts win a penalty thanks to hand ball by Dark Blues defender James McPake. A tactical switch for Hearts as striker Osman Sow makes way for last weekend's match-winner Sam Nicholson. Head coach Robbie Neilson has also pushed new signing Juwon Oshaniwa into a midfield role. 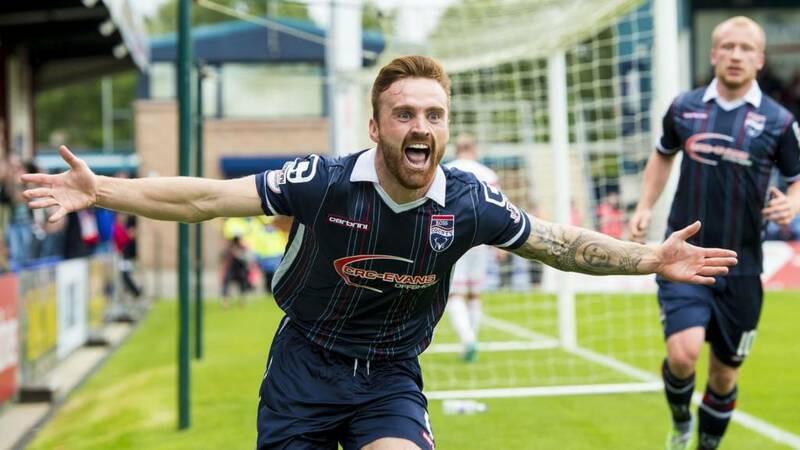 As things stand, Dundee alone sit on six points at the summit of the Scottish Premiership. Celtic, who are at Firhill tomorrow to play Partick Thistle, and Aberdeen, who host Kilmarnock, can join them on maximum points if they win their matches in hand. Dundee United having the better of the early exchanges as Charlie Telfer once again tries his luck from just outside the box, but the shot is smothered by Connor Ripley in the Motherwell goal. Dundee United start the second half with gusto as a quick break down the left flank leads to Charlie Telfer slicing a shot over the bar after a promising move. "Hibs' Scott Allan has been sensational in this first half. He has taken a lot of punishment but he has kept his discipline." Our thanks to Chris MacRae for pointing out a tweet from Hamilton Accies: "Tim Rice, the famous and distinguished composer, is at the game today." "The St Johnstone fans booing the players off after only one shot on target in the opening 45 minutes." And that save by Neil Alexander has kept Hearts in the game and gives Robbie Neilson a more straightforward team talk. Plenty of chances, mostly missed, have kept the fans entertained in Dundee. Kevin Holt arrives at the back post to meet Gary Harkins' lofted cross and his strong, downward header is expertly stopped by Hearts keeper Neil Alexander. Craig Curran will surely be given first choice from the treats tray in the Ross County changing room after those two goals in the opening half put the Staggies in control over Hamilton Accies. Some of the home fans send the Saints players down the tunnel with booing ringing in their ears. They have 45 minutes to avoid successive Premiership defeats. More nice play from Dundee as Nick Ross leaves his man for dead with a lovely dummy but rather than shoot from the left he goes for a cut-back to Kane Hemmings and the ball is squeezed away by a covering defender. Connor Ripley is called into action again at Fir Park as Charlie Telfer strikes from distance. The Motherwell keeper saves low down to his right to keep it goalless. Ross County double their lead as Marcus Fraser plays a lovely one-two before knocking the ball into the centre for Craig Curran to fire home his and County's second. Jim McIntyre's troops are in charge in Dingwall. A careless back pass from Motherwell's Josh Law leads to a United corner. It's swung in and there is a big shout for a penalty as the ball appears to strike Joe Chalmers on the hand. Queen of the South are now two goals up against Alloa, and Ryan McCord's penalty means Raith Rovers now lead Livingston 2-0. Dundee United finally threaten the Motherwell goal as Scott Fraser sees his top-corner bound shot tipped wide by the Motherwell keeper Connor Ripley. Hearts' new signing Juwon Oshaniwa receives treatment on an ankle injury from the physio but he is soon fine to continue. Mild panic over. Dundee United's Coll Donaldson receives a talking to from referee Bobby Madden after a foul on Scott McDonald. The Aussie has been the victim of a few heavy challenges in this match. Michael O'Halloran fires a fierce shot towards goal as St Johnstone look for a leveller but Owain Fon Williams tips wide. Dumbarton and Hibernian are level, with Dominique Malonga cancelling out Gregor Buchanan's third-minute opener for the Sons of the Rock. Soon after unfurling the League One flag, Morton find themselves a goal down to Falkirk at Cappielow. Queen of the South lead Alloa 1-0 and it's the same scoreline as Raith Rovers lead Livingston. Here come Dundee again. Greg Stewart sends Gary Harkins dancing his way into the penalty box from the right but the big midfielder can only find the side-netting with his shot. Ryan Christie and Dani Lopez combined for the opening goal and the duo are at it again at McDiarmid Park, exchanging passes before Christie goes close to doubling his tally. "Every time Dundee go up the park they look like they're going to score." Now it's Dundee's turn to miss a sitter as Kane Hemmings slots a pass through for Paul McGowan, who hits a shot straight at Neil Alexander and the ball is scrambled clear. Scott McDonald tests the Dundee United keeper with a shot from 25-yards but it is right down the throat of Luis Zwick who holds comfortably. Hearts' Jamie Walker has his head in his hands as a flowing move from the visitors ends with the midfielder missing the target with a header after Scott Bain had saved his shot. That really should have been the leveller. The welcome at Motherwell is fantastic, but the tannoy is DEAFENING. Sorry Jonners, what was that? Ross County break the deadlock as Craig Curran fires home from close range. Jim McIntyre will be on the crest of a wave: seeing Scott Fox saving that early penalty and now taking an early lead. Curran earned a corner and seized on a loose ball as McGovern hesitated. Ryan Christie finds space around 15 yards out and drills the ball past Alan Mannus for Inverness Caledonian Thistle's first Premiership goal of the season. Kane Hemmings cuts in from the right and stings the palms of Hearts goalkeeper Neil Alexander. From the resulting corner, the same player is left all alone to nod the hosts in front. Ross County goalkeeper Scott Fox comes to the hosts' rescue, brilliantly saving Ali Crawford's spot kick. Fox atoning for his error and it remains goalless in Dingwall. Fox had fouled Hamilton striker Christian Nade as the marksman was about to pull the trigger. Penalty for Hamilton! Scott Fox fouls Christian Nade in the box. Jamie in Aberdeen: "Hoping Scott Fraser proves to be another gem off the United youth conveyor belt." Motherwell and Dundee United have made their way out to a sea of Well flags being waved by mascots on the pitch. Claret the Bear is also getting in on the flag-waving action. Matches are kicking off around the country. Brad McKay drops to the bench to make way for the Frazer Wright in the St Johnstone defence. There's a surprise return for midfielder Murray Davidson, who is back much sooner than expected from a knee injury. "I always want my players to strive to be the best they can be and then see where that takes them. You've got to have belief. Be the best you can be. Try to get to the top; if you don't make it then it's not for the want of trying. Let's not be in the position we were in last season. We were strong last year at home, we've got to build on that. Teams need to know Fir Park is not an easy place to come. Let's try to lay the foundations of a good, solid season." Dave, Edinburgh: "Just out for the game at Motherwell and well done on the cheap affordable food and drink. Dundee United take note." Peering at the pictures coming in from Dens Park, we're mystified by the attire being sported by the Dundee captain Kevin Thomson. He is warming up wearing tracksuit bottoms, a short-sleeved jersey...and gloves. In August. United won three of the four meetings with Motherwell last season, including a victory in the Scottish Cup. United won the last league meeting 3-1 at Tannadice in January. Dundeemark in Aylesbury will be wincing at those comments a moment ago by Paul Hartley on Rory Loy: "Oh no, what has happened to Rory Loy, not in the Dees line up today? He must be injured, he cannot be dropped after two goals last week." "It was so pleasing on the eye [the 4-0 win at Kilmarnock last weekend]. I thought the players were terrific last week. I thought Rory Loy was outstanding last week but he felt his groin in training. I've brought James McPake in, who has probably been my best player since I came here. He is a terrific leader." "The young players have grown in stature. You have got to look on them as a potential top-six team." "We've been going with three at the back but we can play with five. I've got options. We just want to win the game, we're not worrying about setting benchmarks. Our fans always come in great numbers. Hopefully we can get a result for them and send them down the road happy. Both teams respect each other and have set themselves up slightly defensively. It will be an interesting game, I expect it will open up after an hour. I hope we can get our more athletic players on and expose the gaps." I wonder if John Hughes is regretting not registering as a player... The Inverness Caley Thistle boss is deprived of his two first-choice centre-halves, Gary Warren and Josh Meekings, through injury. And with St Johnstone scoring three times last week, his makeshift defence could be in for a tense afternoon. St Johnstone: Mannus, Scobbie, Wright, Shaughnessy, Easton, Lappin, Davidson, Wotherspoon, Craig, O'Halloran, Sutton. Subs: Clark, McKay, MacLean, Cummins, Kane, Brown, Caddis. Inverness CT: Fon-Williams, Raven, Draper, Devine, Williams, Tansey, Polworth, Horner, Christie, Mutombo, Lopez. Subs: Esson, Wedderburn, Brown, Ferguson, Sutherland. Dundee: Bain, McGinn, Etxabeguren, McPake, Holt, Harkins, Thomson, Ross, McGowan, Hemmings, Stewart. Subs: Mitchell, Meggatt, Irvine, Ferry, Kerr, Konrad, Roberts. Hearts: Alexander, Paterson, Ozturk, Augustyn, Rossi, Oshaniwa, Buaben, Gomis, Walker, Sow, Juanma. Subs: Hamilton, McGhee, McHattie, McKirdy, King, Nicholson, Reilly. Ross County: Fox, Fraser, Foster, Boyd, Davies, Irvine, De Vita, McShane, Gardyne, Curran, Boyce. Subs: Graham, Robertson, Quinn, Franks, Dingwall, Holden, Bachmann. Hamilton: McGovern Gordon, Tagliapietra, Garcia Tena, Kurakins, Gillespie, Imrie, Turner, Crawford, Longridge, Nade. Subs: Kurtaj, Morris, MacDonald, Watson, MacKinnon, Docherty, Martin. James McPake returns for Dundee with Thomas Konrad dropping to the bench. Many of our regular live text visitors will be aware we always enjoy hearing your thoughts on the day's games. please leave a comment on our page and on Twitter please use the hashtag #bbcscotfootball. Scott Fraser makes his first start for Dundee United, the 20-year-old midfielder having signed a three-year contract after progressing through the Terrors' youth ranks. Motherwell: Ripley, Law, Laing, McManus, Hammell, Chalmers, Lasley, Jack Leitch, Johnson, McDonald, Fletcher. Subs: Twardzik, Kennedy, Clarkson, Moult, Thomas, Cadden, Ferguson. Dundee United: Zwick, McGowan, Donaldson, Durnan, Dixon, Souttar, Fraser, Erskine, Telfer, Spittal, Bodul. Subs: Dillon, Rankin, Muirhead, McCallum, Murray, Connolly, Lochhead. interest from Rangers and Rotherham. Recent arrival John McGinn is on the bench for the visitors to the stadium on the banks of the Clyde. St Johnstone play John Hughes' Inverness in Perth as both teams try to get their Premiership points tally running. The Saints scored three goals at Tynecastle last week but still lost out. Can Staggies finish in top six? Ross County have a full squad to choose from for the visit of Hamilton. Here's what my colleague Martin Dowden, who is reporting on the match this afternoon, has to say about County: "Some observers make the Staggies relegation candidates, but I just can't see them being in the kind of position they escaped from with a fantastic run of form from mid-February to May. "A top-six challenge is not out of the question." Motherwell also got off to a winning start last week, returning from Inverness with all three points. Today they play host to Dundee United, who lost 1-0 at home to Aberdeen last Sunday. Dundee welcome Hearts to Dens Park with both teams having scored four goals in opening day Premiership wins last weekend. The Jambos have Nigeria left-back Juwon Oshaniwa in their line-up despite his lack of match fitness. Welcome to BBC Scotland's live text commentary of today's Scottish football action, where we'll focus on the four games in the Premiership but with updates from the Championship and Leagues One and Two.